Thank you for attending one of the Office 2016 New Features classes! As a follow up, below are some of the highlights of what we covered in class. Click Start, point to All Programs, point to Microsoft Office, and then point to the Microsoft Office program for which you want to create a desktop shortcut. Right-click the name of the program, point to Send To, and then click Desktop (Create shortcut). A shortcut for the program appears on your desktop. To open Office applications faster, pin them to your Start menu or the taskbar on your desktop. 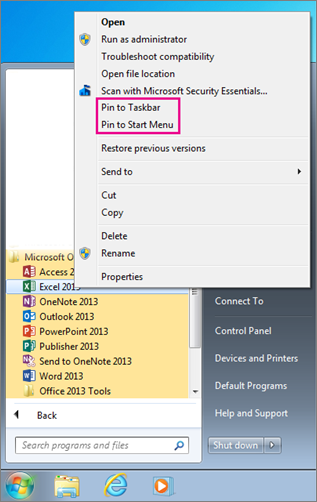 Right-click each application’s name and choose either Pin to Start Menu or Pin to Taskbar. 2. Under "Spacing", select 0 points for before & after, and Line spacing to "Single", and then select the "Set As Default" option. Confirm "For All Documents Based on the Normal Template" option. You can add files and other items, such as messages, contacts, or tasks to your messages in Outlook for Windows. And now, in Outlook 2016 you can easily attach documents you most recently worked on to your emails from the Insert tab. Recent items: Outlook provides you with a list of the recent files you saved or worked with. These files could be saved locally, or they might exist on internal network locations, such as a Shared Drive. Browse This PC: Takes you to your local computer to pick a file. In the Subject box, tell your recipients what the meeting is about. In the Location box, tell your recipients where this meeting will be held. In the Start time and End time lists, click the meeting start and end times. If you check the All day event box, the event shows as a full 24-hour event, lasting from midnight to midnight. ***NOTE*** All Day Events change the time in the "Show As" box to "Free", make sure you check and change that option. In the meeting request, type any information you want to share with the recipients. You can also attach files. Click Add Attendees, and then type the recipients' names, email addresses, or resource names (separated by semicolons) in the Required, Optional, or Resources boxes. Click Scheduling Assistant. The Scheduling Assistant for Exchange accounts helps you find the best time for your meeting by analyzing when recipients and meeting resources, such as rooms, are available. You can use AutoPick under Options to have Outlook analyze when all required attendees are free. 1. Click Meeting > Recurrence. 2. Choose the options for the recurrence pattern you want, and then click OK.
***NOTE*** When you add a recurrence pattern to a meeting request, the Meeting tab changes to Meeting Series. 1. Open the meeting request or notification in your Inbox (rather than in your Calendar). 2. Click on one of the following options: Accept, Tentative or Decline. Edit the Response before Sending: This allows you to include a message with your response. Send the Response Now: Sends a response immediately. Do Not Send a Response: If you choose this option the meeting organizer won't be notified whether or not you'll be attending. It's best practice to avoid using this option. If you will not be attending the meeting, click on the Decline button. Do not delete the request. When you receive a meeting request, Outlook automatically inserts a placeholder for that meeting in your calendar, even before you've had a chance to accept or decline. If you see this placeholder, it means that the meeting has not been firmly accepted. Please act on the meeting request as soon as possible. When you view an email message or a task request, you can respond by organizing a meeting with the sender or other recipients of the message. The Meeting command creates a meeting request and automatically invites everyone who is located on the To line in the message as Required Attendees. Everyone on the Cc line is added as Optional Attendees. You can add or remove attendees as needed. In the message list, click the message, click Home, and then in the Respond group, click Meeting. In an open message, click Message, and then in the Respond group, click Meeting. Enter the meeting location and start and end times. Add or remove attendees, include attachments, or use Scheduling Assistant to find the best meeting time. The header and body of the original message are included in the body of the meeting request. 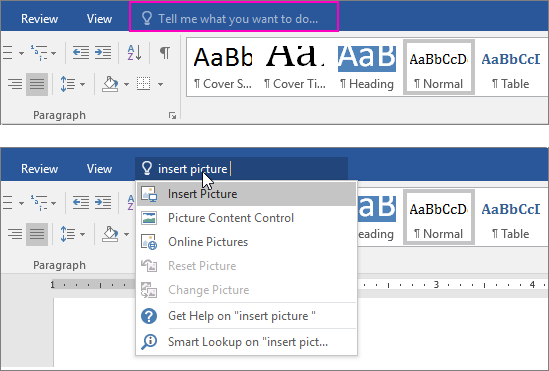 You'll notice a text box on the ribbon in Office 2016 apps that says Tell me what you want to do. This is a text field where you can enter words and phrases about what you want to do next and quickly get to features you want to use or actions you want to perform. 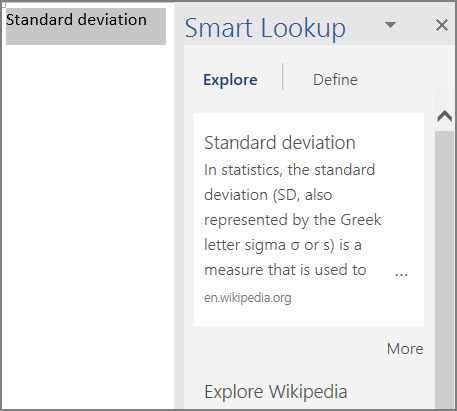 You can also use Tell Me to find help about what you're looking for, or to use Smart Lookup to research or define the term you entered. NOTE: If you are on a touch device, double-tap the word to select it and then tap Smart Lookup or .